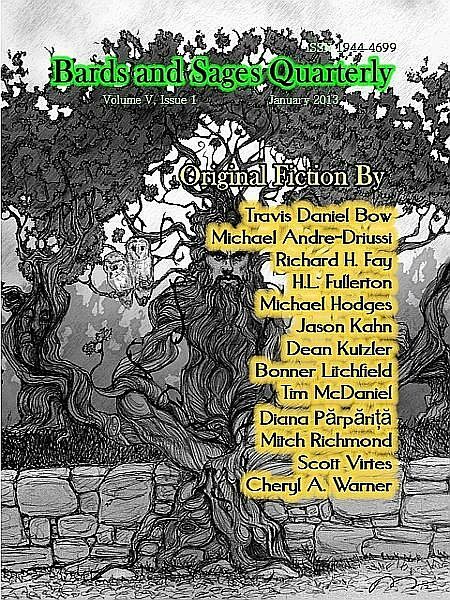 Since 2009, each issue of the Bards and Sages Quarterly has delivered a unique variety of character-driven speculative fiction short stories from both new and established writers. Our writers include first-time authors, Pushcart Prize nominees and Nebula award winners. The January 2013 issue includes original short fiction from Michael Andre-Driuss, Travis Daniel Bow, Richard H. Fay, H. L. Fullerton, Michael Hodges, Bonner Litchfield, Jason Kahn, Dean Kutzler, Tim McDaniel, Diana Parparita, Mitch Richmond, Scott Virtes, and Cheryl A. Warner.